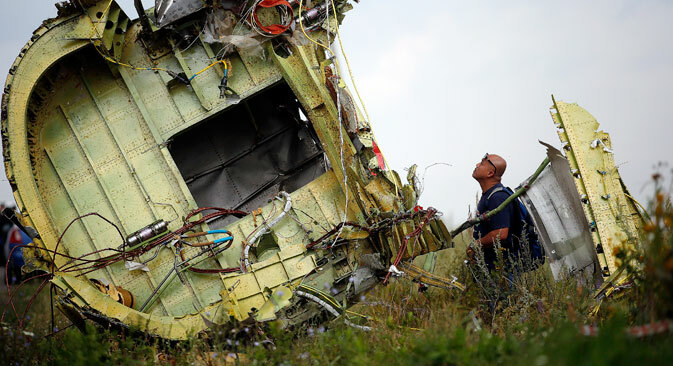 The Kommersant newspaper reports that the U.S. intelligence representatives held a closed-door briefing in Washington on the downing of Malaysia Airlines flight MH17 over Ukraine. According to the U.S. intelligence service, writes the publication, the plane was shot down from territory controlled by the militants. Yet, U.S. intelligence officials refused to provide any documentary evidence to journalists that would have supported their own conclusions, highlights Kommersant. “According to them, the U.S. Intelligence Community bases its conclusions on satellite images and intercepted messages and data from social networks,” the newspaper writes. Nezavisimaya Gazeta notes that the Boeing crash has had no influence on the position of Brussels. According to the publication, the European Council on Foreign Affairs issued instructions to have a new list created by Thursday, containing the names of people that could be added to the sanctions list of individuals and entities in Russia thought to be responsible for the escalation of the conflict in eastern Ukraine. Contrary to U.S. demands, emphasizes Nezavisimaya Gazeta, for Brussels this catastrophe has not served as a wake-up call, and the third stage of the sanctions will not be implemented. Washington’s argument that this tragedy was caused by the pro-autonomy militias, for whose actions Russia must be held accountable, based on data from social networks and the overall assessment of the operational environment, but first and foremost – based on intelligence findings, which the U.S., however, is no hurry to publish, the newspaper tells its readers. “U.S. intelligence has found no evidence against Russia in the case of the Boeing,” writes Gazeta.ru. Nearly one week after the plane crash, U.S. authorities admitted, says the publication, that they have no evidence showing a direct Russian link to the catastrophe. According to the publication, in the United States they lamented that the search for clues “was carried out on fakes found in social networks, replicated and posted, without due diligence, by Ukrainian authorities”: for example, according to a source in the U.S. Intelligence Service, Kiev posted a video showing a Buk missile system. This unit, from which the missile that brought down the Boeing 777 was supposedly launched, was said to be crossing the Russian border. However, later it became known, reminds Gazeta.ru, that this video had nothing to do with current events. Earlier, the U.S. made a number of loud statements about Russian involvement in the plane crash, reminded the publication. Direct accusations of Russia’s complicity in the attack on the Boeing were made by U.S. Secretary of State John Kerry, but Moscow, in turn, countered these accusations and called on the U.S. to start working on getting a clear understanding of the situation, emphasizes Gazeta.ru.